Following the drone attacks at London Gatwick airport in December and the crippling closure of the airport to air traffic at one of the busiest periods of the year for air travel, airports are being encouraged to invest in developing measures to counter the threat before it can develop. The actions taken at Gatwick from Dec. 19-21 (and briefly at Heathrow on Jan. 8) followed the standard response when a drone or unmanned aerial vehicle enters the control zone of an active airport. The potentially catastrophic result of a collision between an aircraft and drone, and the damage which could result from a collision with an aircraft or airport infrastructure, poses an unimaginable threat. In the case of Gatwick, whose drone operators have still not been identified, it uncovered just how open airports are to this kind of attack and how ill-equipped they are to countering such an attack. With so much at stake, from passengers to profits to safety, what can airports do to deal with this threat? 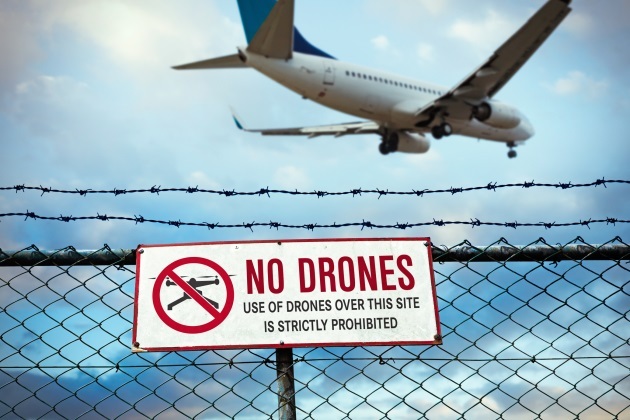 New proposals put forward by the United Kingdom government aim for greater buffer zones of 5 km (up from 1 km) around active airport boundaries where drones are not permitted to fly without permission. All operators must also be registered and pass a competency test. However, these rules would not restrict anyone who planned to operate a drone with ill intent from entering this restricted airspace. At Gatwick, military intervention was relied upon to track and bring down the ongoing drone infiltration, but U.K. Defense Secretary Gavin Williamson said this intervention should not be expected in every case. Since December, Gatwick has invested in new technology that will detect drones and help prevent them coming too close to the airport; Heathrow has confirmed it is also investing in similar measures. Yet this threat exists not only in London, but at every airport around the world, big or small, and is only likely to grow as copycat operators and even terrorist groups intent on finding deliberate ways to harm aviation turn to drone technology. Much of the technology currently available to secure airports from the threat of drones remains secretive and expensive, and includes so-called defensive methods of jamming radio signals, taking over control of drones, and downing them through the use of lasers or trained birds of prey. As counter-drone technology develops and laws are introduced, the opportunities for operators will diminish, but never completely go away. The key is in airports acting strategically to stay ahead of the threat.